Cast: John C. Reilly, Sarah Silverman, Jack McBrayer, Jane Lynch, Alan Tudyk, Ed O’Neill, Gal Gadot, Taraji P. Henson, and Alfred Molina. Ralph Breaks the Internet adds a whole lot of laughs and references in the film! As far as sequels go, Ralph Breaks the Internet knocks out of the arcade with glee and laughter. 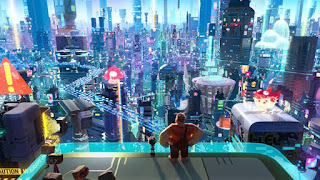 The film marks the 57th film from Walt Disney Animation Studios after two years.Ralph Breaks the Internet is the first Disney animated sequel since 1990 to be released based on the original film. Directors Rich Moore and Phil Johnston bring another adventure-filled video-game film that will take the audience on the trip to another world of pop culture. In the film, I get to see the titular character Wreck-It Ralph (voiced by John C. Reilly) and Vanellope (voiced by Sarah Silverman) return as their main roles in the sequel. The supporting cast of Jack McBrayer, Jane Lynch, Alan Tudyk, and Ed O’Neill also return. Other than the returning cast, new actors are included as well. The main actor who steals the show is Wonder Women star Gal Gadot who voices Shank, the racer of her game Slaughter Race. The other two new actors appear in the film: Taraji P. Henson plays the role as Yesss and Alfred Molina voices Double Dan. Ralph Breaks the Internet is a great film with diversity actors and numerous plotlines. With the direction coming from Rich Moore and Phil Johnston, the story and the animation is well done. The music from composer Henry Jackman is outstanding. What I found very amusing and funnier throughout the film is a big bucket of Disney pop culture that includes Disney Princesses, Pixar films, Star Wars, and the Marvel superheroes to make the film more entertaining just like the first film. The notion of Disney pop culture really gathers the audience’s attention, especially children. To top it all off, a cameo from comic-book writer Stan Lee is shown which gives the film bonus points. Compared to 1988’s Who Framed Roger Rabbit, the directors have done a similar job of obtaining the rights from several studios and artists who created such beloved characters in Ralph Breaks the Internet. However, the usage of Internet culture, including Google and YouTube, isn’t the best idea for the film’s structure and the film did not include the famous videogame character, Mario, as promised. As I aforementioned, Ralph Breaks the Internet is exciting, surprising, and worth the watch as a Thanksgiving treat. It’s great to see the characters back on the big screen from any Disney properties. I have no complaints on the film regardless of the massive use of pop culture. Ralph Breaks the Internet is a fun-filled 112-minute adventure that will take you out of this world. Just the readers know, the film marks the passing of the legendary Stan Lee on November 12, 2018 as well as the 90th Anniversary of the creation of Mickey Mouse. Ralph Breaks the Internet will be released on November 21st, 2018.